I think I'll start a new series (to be continued until we put the house on the market), called, What Could Possibly Go Wrong? That's Tim and his bud, Samson (who, by the way is afraid of heights), hanging the chandelier* in the hallway. I accompanied them on their lunch break (that's about all the pitching in I'm willing to do on Project Nerd's project days) and speaking of shoes, discovered something I did not know about Samson: He has a women's shoe fetish. Actually, it's more of an anti-fetish. While eating at Half-Fast Subs (just had to give them a plug, both because I love the name, and because the sandwiches are devine), several women in sandals strolled in. Samson became fixated on their feet. He told me what he hates most is to see a lovely lady, all dolled up in a lovely outfit, only to be ruined by shoddy shoes. Who knew? I thought us gals were the only ones who cared about what we wore on our tootsies. Samson went on to say that what he particularly finds offensive is when a woman's toe peeps through. He's just not that into toes. (He's not the only one who takes offense at exposed toes.) He then proceeded to tell me about seeing a picture of Paris Hilton. "She has the most disgusting feet. She was wearing these sandals and her toes hung over the front," he shuddered. At that moment, I was extremely thankful to be wearing sneakers. He then listed what are for him, the grossest feet in movie history. I shall spare you the list in its entirety, but rather, shall only let you in on #1: Uma Thurman in Kill Bill - the part where she just got out of the coma and is getting into the car. Apparently, her toenails are rather long and gnarly. (Does anyone else remember this?) Samson was only mildly placated when I commented they were probably using a stunt foot. Ladies, shoes are apparently not just for us. Such a discovery! Did anyone else know this? And if so, why didn't you tell me? In the next installment of "What Could Possibly Go Wrong?" Tim tackles large mirror removal in small bathroom. A mallet and duct tape are involved. * No husbands, helpers or elk were harmed in the making of this blog post. Sheesh. 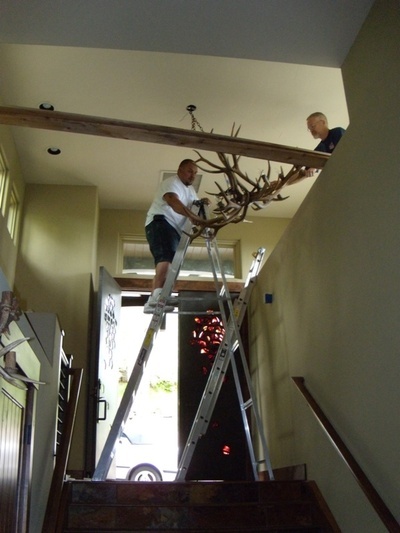 The antler chandelier is from shed antlers. I've been told I have cute feet and toes. I should send a pic to Sam for evaluation. What's his email address? HA! He's coming over tomorrow to help Tim with more burly man stuff. (I'm getting my hair done.) Email me the pic and I'll show it to him - if you dare! This page contains a single entry from the blog posted on June 30, 2009 11:24 AM. The previous post in this blog was She Hates Me. The next post in this blog is Hi Ho, Hi Ho.